Jessica Webster is the Assistant Principal at Hopewell Memorial Junior High School and loves collaborating with students, parents and teachers in developing confident critical thinkers with a passion for life-long learning. She began her career as a special education teacher, serving as the Director of Special Education for an urban charter high school in Philadelphia, PA. She then taught middle school special education and history in Chapel Hill, North Carolina, serving as the eighth grade level chair before moving to Pittsburgh, PA where she served as the Inclusion Specialist for the Mt. Lebanon School District for six years. Throughout her tenure in education, Mrs. Webster has sought opportunities to focus on student engagement, social-emotional learning and building and supporting equitable and inclusive school cultures. 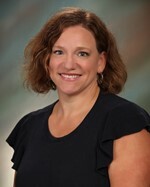 Mrs. Webster received her Bachelor’s Degree in Education from Miami University of Ohio, a Master’s degree in Literacy Education from UNC-Chapel Hill, a Master’s degree in Educational Leadership from Edinboro University and is currently enrolled in the University of Pittsburgh Educational Leadership Doctoral Program. While school administration is her job by day, Mrs. Webster enjoys spending time with her husband, three children and two dogs, restoring and renovating her 1836 home, reading great novels and spending time outdoors. You can find out more by visiting http://jgroteweb.wixsite.com/jwebsterportfolio.